Today I'm sharing just a dinner recipe that I made one weeknight. It's simple and scrumptious and full of flavor, and just as wonderful leftover for lunch the next day! Preheat the oven to 350. Spray a baking dish with non-stick spray. Cut the top 1/2 inch off each pepper (saving the tops to chop and add to the filling later), then remove the ribs and seeds from the inside. Set the peppers in the baking dish and set aside. Break up the beef in a skillet over medium heat, cooking it for about 5 minutes, then adding the reserved chopped pepper tops, onion and jalapeno. Season with salt, pepper and cumin, then continue cooking until the beef is browned and the vegetables are beginning to soften but not fully cooked. Add the garlic and cook for 1 minute, then turn off the heat. In a large bowl, combine the beef mixture with the corn, black beans and green chiles. Now is the time to taste the filling and adjust seasoning. I kicked up the spiciness with a generous sprinkling of cayenne pepper, as well as more cumin and some garlic powder. Stir in half the cheese. Spoon the filling into the peppers, right to the top. Drizzle the stuffed peppers with the olive oil. Cover loosely with foil and bake for 30 minutes. Remove the foil and bake for an additional 10 minutes - the peppers should be crisp tender, but not too soft or mushy. Sprinkle the top of the filling with the rest of the cheese, and turn on the broiler to brown the cheese for 3-4 minutes. Serve the peppers with a spoonful of cooked Spanish rice. Absolutely love! I used red/green/yellow peppers! Even got a kid to try them! i'm trying to print this, but the copy function is disabled. is there a way to print your recipes? my ad blocker must be blocking the pop-up. 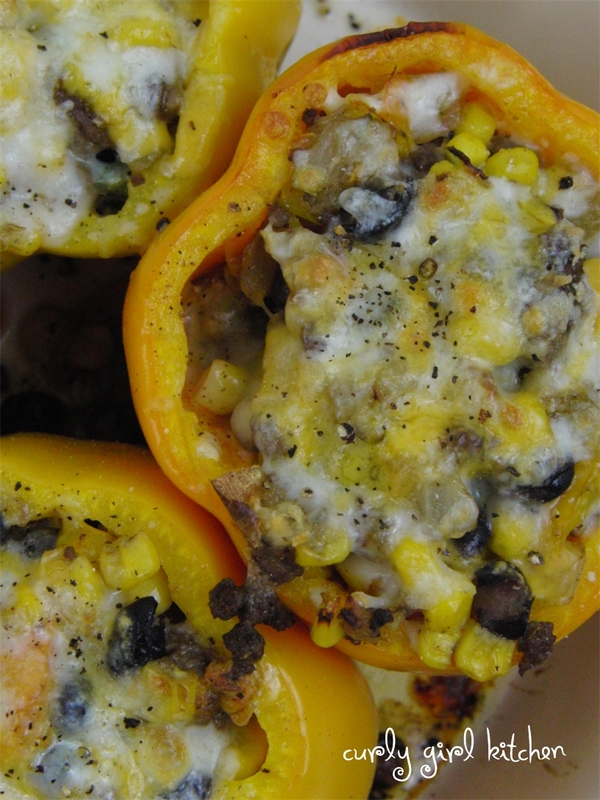 guess i'll just run back and forth to my computer -- making these tonight with peppers from the garden! thank you! and the recipe was delicious (i added some frozen spinach and it was good, too!) definitely pinning and saving for later.